High above the quiet calm of the Comox Valley a war has been raging. Snow has been squaring off against dirt for weeks, but with the recent slightly warmer temperatures, mountain bike terrain of epic proportions has been revealed. Living up to its reputation of being an all-season resort, Mount Washington has a calendar jam-packed with summertime events. 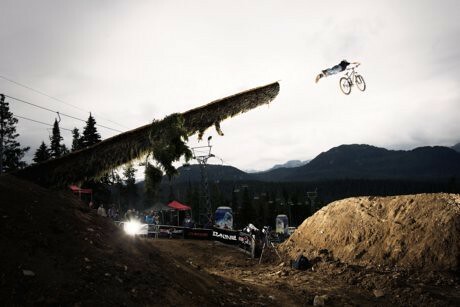 The mountain welcomes the BC Cup Provincial Championships on August 13-14 and Darcy Turenne’s See Jane Jump Women’s Mountain Bike Festival on August 20-21. Perhaps most anticipated is the return of the Bearclaw Invitational on August 5-6. Whether you’re a seasoned rider or curious to get started, Mount Washington is well-suited for everyone. You can try riding on for size – $65 will get you a two-hour lift pass and a top-of-the-line Rocky mountain bike rental. Regulars may want to shell out for the brand-new Dirt Pak, getting you three one-day lift passes for $111. For more information on Mount Washington Alpine Resort’s mountain bike park and biking events, visit the bike park online. Please remember to ride safely and be aware of other riders. Helmets are mandatory throughout the entire bike park and body armour is recommended. You can find Mount Washington Alpine Resort on Facebook and follow their updates on Twitter.